Safran Hall Rededication was AWESOME! I want to personally thank all of our guests, donors, and volunteers! We had approximately 75 people attend the Cocktail Party and Silent Auction! Our Acoustic Guitarist, Ross Griswold, was awesome too! Congratulations again to Dr. Stephen and Pat Safran, part of our event team, and our honorees! Safran Hall Rededication Event to Feature Singer/Guitarist ROSS GRISWOLD! Shower our kitchen with love! Who was Rachel Wolff Safran? As you may have heard, Beth Mordecai is hosting a rededication of Safran Hall, our recently-remodeled social hall, on June 7. The hall is named after Rachel Wolff Safran, whose family is intimately intertwined with our congregation’s history. Rabbi Ari Saks had the opportunity to speak with her grandson, Henry Safran, and granddaughter, Susan Hermanos, about their family’s legacy in Perth Amboy. We hope that you will join us in celebrating the facelift of our amazing hall, named after an amazing woman and amazing family. 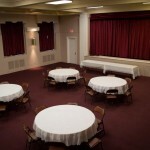 Announcing our Safran Hall Rededication and Silent Auction! Safran Hall Auction Gallery goes LIVE! Safran Hall Rededication and Silent Auction is ON!